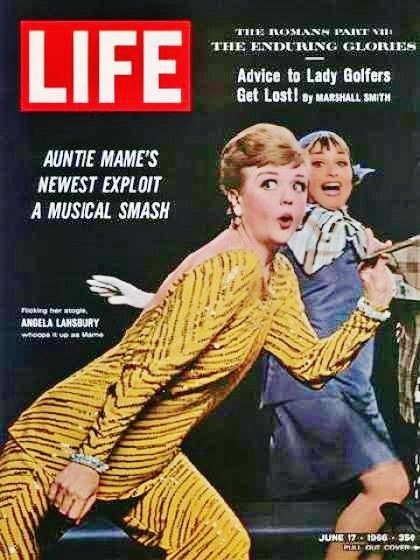 It was inevitable that Auntie Mame would become a musical. The only question is: why wasn't it from the start? The original play by Jerome Lawrence & Robert E. Lee taken from Patrick Dennis's bestselling 1955 novel was chock-a-block with characters, incidents and obvious song cues. It had a cast of 32 in 40 speaking roles, and so many scenes in various locations they didn't bother to list them. It premiered, aptly, on Halloween 1956 and was an immediate hit. Warner Bros quickly snapped it up and delivered it as their '58 Xmas present to Radio City Music Hall; before turning into the top grossing film of 1959. It only took seven years to return, repackaged as a musical; an even bigger Bway smash, coming full-circle back to Hlwd as one of the last Golden Age musicals to be filmed. Quite a feat of recycling. Enuf for a whole book to be written about it in 2004, by Richard Tyler Jordan. But tho rabid Show Queens rally for a major Bway revival (and inevitably someday there will be one) neither play nor musical are really screaming to be examined these days. 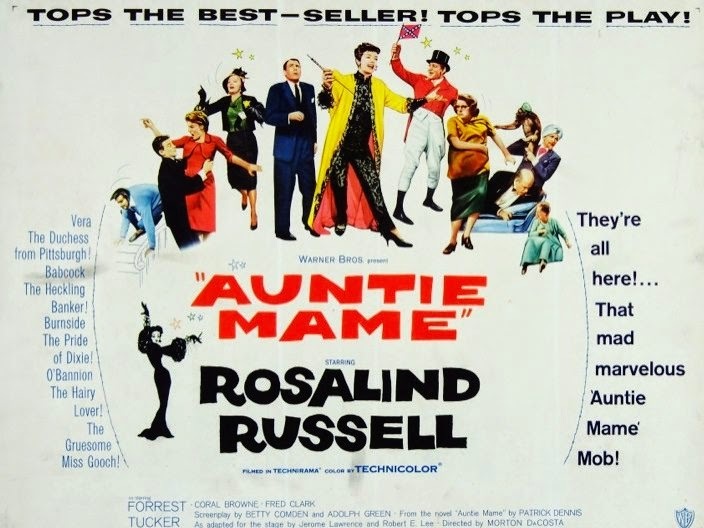 If you read it now, Auntie Mame is awfully antique. The antics are as racy as an episode of The Golden Girls. 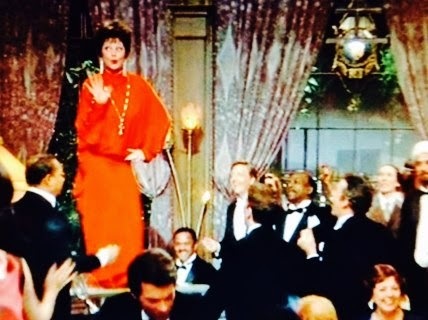 And yet, for at least a couple of generations, "Auntie Mame" was lingua franca for the lovable lunatic; an unoffical Saint of the Unconventional; a proxy relative for the misunder-stood; the outcast; the gay. Patrick Dennis certainly lived his own dream. He seemed to me an Edward Gorey character; garbed in houndstooth suits and fur-lined coats, with manicured facial hair; a cultivated oddball. He was an ambulance driver in the War, turned writer in the '50s; a husband and father, then later a notorious trawler in Village gay life. Tho he'd never top Auntie Mame (which spent 112 weeks on the NYTimes Bestseller List), and it's sequel: Around the World With... he had success with a number of other books, including Little Me, which was turned into a musical before Mame. Despite his sales, his literary merit wasn't lasting, and by his death in 1976 at age 55, all his works were out of print. Still he could have retired comfortably on his fame & fortune but chose to work in anonymity as a butler in his later years. And yet as fascinating as this sounds (for the full picture consult Eric Meyer's entertaining 2001 bio, Uncle Mame) there's something not quite weird or special enuf to warrant further study. No film is crying to be made. Even his most famous, most lasting creation, Mame Dennis is already fading to the scrap heap of cultural history. Or is she? Like most mid-century kids I'd had my first exposure to Auntie M from the original Roz Russell film. I'd even read the novel before the musical arrived in '66--when I was still but 15. The OCR was in my frequent rotation. But I was disappointed in the show when it came thru the LA Civic Light Opera with no less than Angela Lansbury in the summer of '68. It was big, bright, and fast-moving. But it felt, surprisingly, shockingly, empty. (It felt emptier still in a theater-in-the-round version I saw a few years later with a sadly tired Jane Russell.) Despite Herman's score--it seemed reductive. It still does. The play's authors, Jerome Lawrence & Robert E. Lee were the musical's librettists as well. They attempted scenes to differentiate from the play: Beauregard was made an English earl, with a British salute, "Mame, the Most" in place of the ultimate title tune. But they reverted to the play's Southern detour; and on top of paring scenes down to the bone, and combining Gooch with Patrick's nanny, it seems a watered-down version of the play. It didn't help that its scenery (tho modern and much praised) was fairly skeletal, stripping away yet another layer of the lavishness that was Life at 3 Beekman Place. 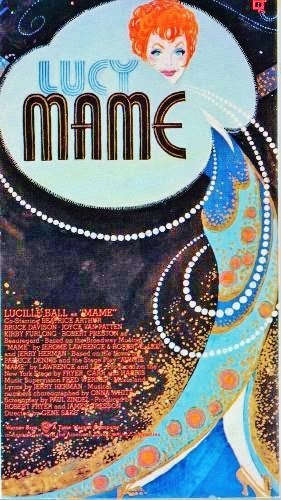 Mame's most arresting visual image remains the show's Bway poster--a '60s update of a '20s style in blazing yellow, with hints of red. It looked terrific looming over the block long Winter Garden. The show inside was a bit thinner. As if to compensate for this skinless diet plate, Jerry Herman's score (as heard on the OCR) was lavished with the most declarative orchestrations in memory. The overture's opening notes blast at you with such force, they seem a parody of the big, brassy Bway musical--almost cringe-worthy in their cheerful insistence. The show's chorus, too, is on the large side and given to going full out every moment. Jerry Herman's songs are mostly joyful and catchy in the Irving Berlin manner, and better than most of Hello, Dolly. I'm not in love with Gooch's two solos, nor does "My Best Girl" rate any better than serviceable (I'm not a great fan of Herman's ballads); and "That's How Young I Feel" feels like so much padding (which is why it was cut from the movie--and, to my knowledge, was only a crowd-pleaser when redesigned for Ann Miller in her Bway tenure). Would a song called "Life is a Banquet" be too obvious a crib for Mame's philosophy? After all, it is the play's signature line. But Herman chose instead to "Open a New Window," with inarguable results--tho a tough slog for those allergic to unalloyed optimism. The rest, as they say, is cherce. "We Need a Little Christmas" induces the desired jollyness, especially with its polka finish. Vera's two numbers are the kind that win actresses a Tony (as did Bea Arthur). Her duet with Mame, "Bosom Buddies" has enuf bitchy barbs to remain a variety show staple. "The Man in the Moon (Is a Lady)" sounds like nothing ever heard in a '20s operetta, but it's funny. In fact nothing in the score sounds like the period it serves--it couldn't sound more '60s Bway if it tried. Which is fine with me. "If He Walked Into My Life"was a Grammy-winning hit for Eydie Gorme, and covered by dozens of others. It's a better than average ballad for Herman, somewhat in the manner of Harold Arlen's "Man Who Got Away," with as much red meat for an actor as a singer. My favorite rendition is by Nancy Wilson from a Capitol album Just for Now. Her vocal is terrific, but the arrangment and orchestration is beyond brilliant; it's hard to imagine another that brings out each phrase so perfectly. Go Youtube it. "It's Today," like "Open a New Window," is insistently uplifting but I confess to finding it irresistible. The tune (recycled and expanded from Herman's '59 Off-Bway revue, Parade, where it began, "There's no tune as exciting as a show tune...") is all that it's cracked up to be. For what it is celebrating is more than "today;" it's the sheer, fabulous and utterly ridiculous exuberance of the Bway showtune. Having written the most popular showtune of the last decade in his last show, what were the odds Herman could equal the feat with another title tune? "Mame" got another sassy Louis Armstrong recording and plenty of covers from pop and instrumental groups. The song, as rather definitively performed on the OCR, stakes its claim to be the production number to outdo all production numbers; starting from a sweet banjo strum, thru a slow build into a frantic Onna White ballet, before skidding to an all-together-now final chorus so emphatic it either blows the roof off your mind, or feels kinda grating. The song is, much like "Hello, Dolly!," a nonsensical tribute to a character who doesn't really merit such an ovation in such circumstances. Her name is evoked (and often stretched to two notes on a descending slope) no less than 24 times. But again, who cares? When the song is this good, the show fits around it rather than the other way around. "Mame" is the very definition of the sort of number they were constructing for "One" in A Chorus Line. Now bring in that star they're all cheering and the audience rides the tide sweeping out across the footlights, in her glorification. 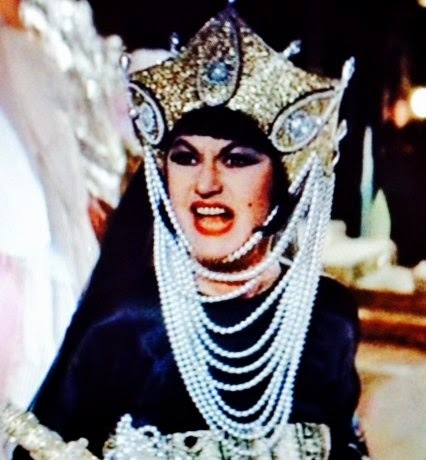 Pauline Kael called it the ultimate drag queen part, which makes it like Peter Pan, a trouser role played by a woman. 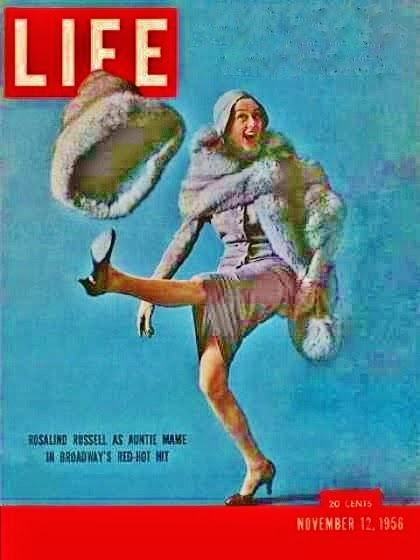 It certainly could be played in drag, but Roz Russell made sure it was played like Rosalind Russell--which regenerated a late Hlwd career streak for her, while her contempoararies were mostly over-the-hill or reduced to playing grotesques. Casting the musical was a long multi-candidate process that ended with Angela Lansbury--to everyone's surprise, but, once seen, to no one's objection. Within days of the opening she had a Tony Award. And from then on the Roz lock was broken. Celeste Holm got the first national tour; Janis Paige was the first Bway replacement. Ginger Rogers headed the London edition; Susan Hayward headlined a tab Vegas version, and Jane Morgan and Ann Miller finished up the Bway run. Ethan Mordden calls it a Big Lady musical; a show that celebrates the Star as much, if not more, than the character. In that regard imagine if they had managed to get Judy Garland in shape for a stretch of the Bway run? Jerry Herman desperately wanted it, to say nothing of her legion of fans. And let's face it, she's sort of an Auntie Mame already--surely for the gays. And Judy singing those songs! If only. Still the role accomodates as many personalities as there are aging actresses to take her on. Which made the film a prime catch that many a fish hoped to hook. Angela was so hailed, her image and career so transfigured that she'd seem a natural to carry over. On top of that she was up to then primarily a film actress, with Oscar nominations as far back as the '40s; but a motherly fixture by the '60s (Elvis' mother in Blue Hawaii, but only ten years older; and as the monstrous linchpin in The Manchurian Candidate, similarly, mom to Laurence Harvey--three years her junior!) Like Roz, Angela revived her career in her 40s as a musical comedy star--but she took it more vocationally and continued along in that vein for another four Tony awards; as well as the occasional pic, and a long-running TV series as an elderly amateur detective. So didn't she deserve the movie Mame? But then this was a Big Lady role: a Big Hlwd Star role. So let's consider first the reigning musical Divas: Julie Andrews--too British; Streisand--not as poor a fit as Dolly was, but still wrong; Liza Minnelli, on the young side, but a credible possibility. Debbie Reynolds and Shirley MacLaine were well within range. But somewhere, in some office somebody put together two words: Lucy+Mame, and the ball got rolling before anyone had the sense to stop it. You can see what they imagined: a wacky Lucy Ricardo-ish elder Aunt, with that slapstick timing and a voice. . . well, there's always Lisa Kirk around for voiceover. Only they didn't dub Lucy. They also didn't get "Lucy" as she brought her own idea of how to play the role, which was like Greer Garson (who was Russell's first Bway replacment--the second was the deliciously cuckoo Beatrice Lillie); Lucy was a peerless comic actress, but without a script--by her own admission--she wasn't funny or spontaneous. 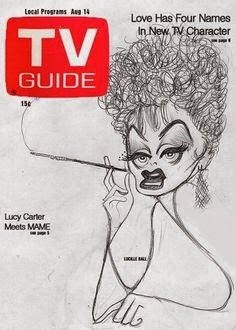 Lucy Ricardo is impersonated once in awhile, but there's a reason drag queens don't do Lucille Ball. She's not Larger Than Life. And first and foremost Mame must be. On the other hand, Beatrice Arthur gives a very convincing drag turn--I'm sure there are those who believe she is a man. She's everything that's lacking in Lucy's perf; doing more with one glaring glance or a single word ("Pity" or "Yes" upon being told she loves children) than Ball mines from a whole page. She'd also had a long run on Bway to hone every last morsel out of her too-brief role. After her scene-stealing parts in Fiddler and Mame, someone had the bright idea of writing a musical just for Arthur. But A Mother's Kisses, from Bruce Jay Friedman's Jewish Mother satire, with a score by Pajama Game's Richard Adler, and directed by Mame's Gene Saks and Onna White, closed out of town in Baltimore. Bea would find her wings several years later in television. The same month as the the movie's release, the final episodes of Here's Lucy were airing on CBS, ending Ball's longtime dominance as a TV star. But making bigger news that season was a new sitcom that made Bea Arthur a popular and controversial national heroine. The following season Maude was given Lucy's longtime Monday berth. Jane Connell was the sole other recruit from Bway deemed worthy of carrying over. In the original play and movie, Gooch was a bigger scene-stealer than Vera Charles. ; for Peggy Cass it was the role of a lifetime, winning her Tony and Oscar nominations. Connell makes lesser impact. Yet the role was plum enuf to attract Helen Gallagher and Marilyn Cooper as Bway replacements, and Loretta Swit (prior to MASH) on the road. 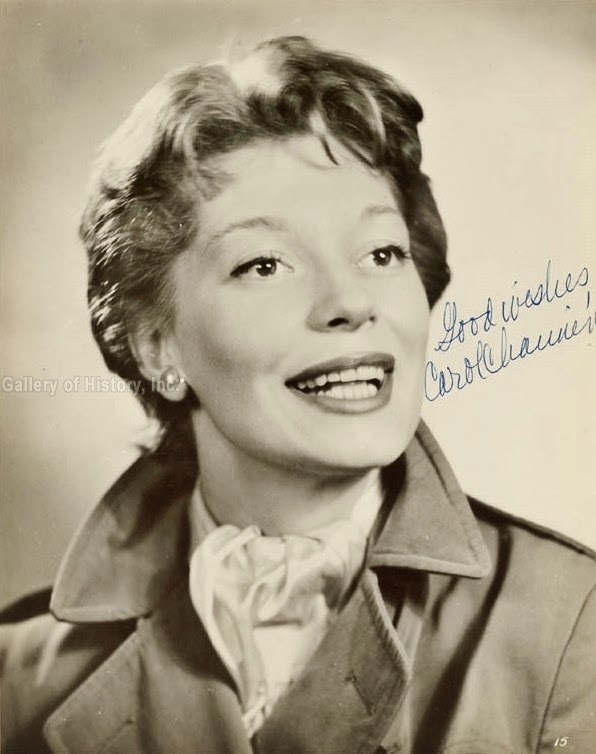 Audrey Christie who had brief but memorable scenes in Carousel and The Unsinkable Molly Brown pics and played Vera to Janis Paige's Mame on Bway, was demoted to Mrs. Upson for her penultimate film appearance. Bway's young Patrick, Frankie Michaels, charmed his way to a Tony. But the movie's Kirby Furlong is charmless and often wooden. Together, he and Lucy make a dull team. But Bruce Davison makes for a pleasant change from the usual bland, slick-haired, Ivy League jocks who play older Patrick. The film's major casting upgrade, however, is Robert Preston; as dashing a figure as Rhett Butler (which Mame herself references--a full six years before Gone With the Wind was published), with a mellifluous speaking voice perfect for song. He takes command when he enters the film, and there's finally some real bounce to it. He's like a Grand Marshall leading the parade that is the title tune but he's not dispatched from the story as quickly as in versions past. Herman wrote a new song, "Loving You," the sort of waltz ballad suited to Preston's rhythm; which begs the question if it was first written for Mack & Mabel. Lucille Ball had headlined her own musical in 1960, during her hiatus between sitcoms and husbands. Despite poor reviews Wildcat was a big draw on Lucy's name, and might have been successful had she stayed in it more than six months. But accustomed to weekly changes of script, repeating a show eight times a week was a real ordeal. A year later she was back at CBS, doing what she did best--starring in a top ten show for another dozen years. She managed to squeeze out another couple of movies, with Bob Hope and Henry Fonda (a box office hit, Yours Mine & Ours, which inspired The Brady Bunch.) But that was five years prior to Mame. Besides her misplaced casting, she was 62 years old!--at least a decade older than all her predecessors (Roz was 49, Angela 41--even Ann Miller who seemed to come out of retirement was but 45). So much comment was made of Lucy's soft focus closeups that I was expecting them to be more pronounced than they really are. But her movements give her away as well. She's a game gal on roller skates, or put front & center in the title tune, but there's a studied caution in her step; the chorus handles her with kid gloves. It's the kind of Fame-Over-Reason billing that brings longtime fans into live theater, and gets by on distance and spontaneity--the essence of the Big Lady musical. But on screen it needs more credibility, not less. the right size and oddness the role requires. And who then for Vera Charles? That's easy: Elaine Stritch. And handsome baritone Peter Palmer could've moved beyond Li'l Abner as a suitable Beauregard. As it happened, he was starring opposite Channing in the spring of '74 (when Mame hit the screens) in a thinly disguised revival of Gentlemen Prefer Blondes, now told as a reminiscence by an older Lorelei. Merman won over skeptics resurrecting Annie Get Your Gun after 20 years, but Channing was 25 years beyond this ditzy blonde and the results were less forgiving. 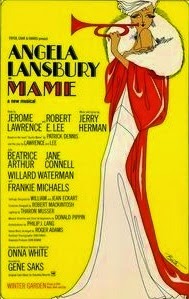 Lansbury returned to Mame 15 years after the original production, but this time Bway wasn't remotely interested. It was gone in five weeks. Film audiences weren't particularly enthused either; the movie made a disappointing $6.,500,000 in rentals. Bill and I saw it at Radio City, two weeks after its premiere. It left so little impression I never watched it again until now. In a year when the top movies were The Sting, The Exorcist, Magnum Force and Blazing Saddles, Mame felt decidedly out of step. Yet an unabashedly old-fashioned retrospective of MGM's musical treasures was a surprise hit that same spring. That's Entertainment reminded, or introduced audiences (i.e. me) to a catalog of Hlwd craft and talent that vanished with the dismantled studio system. Somehow this pic felt relevant where Mame did not. Of Jerry Herman's 7 Bway musicals, three were flops, one a modest success and three were smash hits. Not a bad average, but only two were made into films. Tho he surely promoted the movie Mame with pride, I suspect deep down he was as disappointed as everyone else. 1974 wasn't a good year for Herman. The movie aside, he was more hopeful for his first new musical in five years, after the crushing defeat of Dear World. 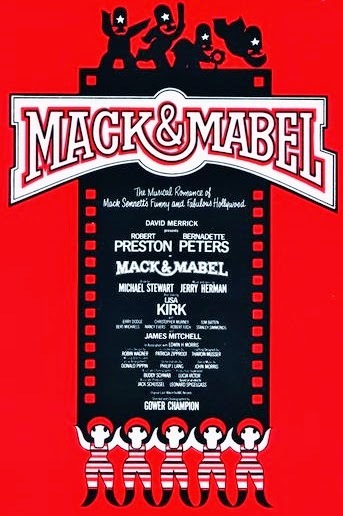 But despite a trove of talents in fine gear: Robert Preston, Bernadette Peters, Gower Champion, David Merrick, and not least of all, Herman back in top melodic form, Mack & Mabel rubbed against the prevailing cultural mood with critics and public alike and quickly closed. In a weak year of competition it nonetheless received Tony nominations in every category, including Michael Stewart's book (regarded as the show's biggest flaw) but shockingly not for Herman's score; egregiously snubbed for the likes of The Lieutenant (a one week flop about the Mai Lai massacre set to a rock score) and A Letter for Queen Victoria, Robert Wilson's experimental opera with music more academic than pleasing. Even Shenandoah's R&H-lite score was a far lesser achievement than Herman's sprightly tunestack. It took Torvill & Dean, an Olympic ice-skating team in '84 to renew public excitement in the score with their dance routine to Mack & Mabel's overture (off the OCR).. Many a concert version has taken up the mantle; and Brits especially love to perform the numbers. To date no one has ever figured out how to make the book work. 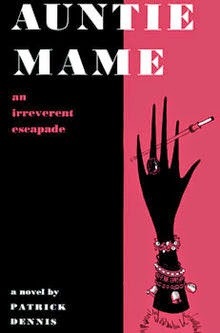 Mame's book was by-the-numbers but it worked well enuf, tho the play was richer in detail and the '58 film better yet. But how producers Robert Fryer & James Cresson came upon choosing Paul Zindel to pen the screenplay is a mystery. A chemistry teacher turned children's book author & playwright, Zindel won a Pulitzer for his kitchen-sink drama, The Effect of Gamma Rays on Main-in-the-Moon Marigolds (a girl's science experiment in radioactivity underlines the toxicity of a dysfunctional family of women). A natural match for Auntie Mame--it's not. As far as I can tell not a single comic line was added to the film, and a good many removed in the bargain. The movie opens cold upon John McGiver reading the will which bequeaths Patrick to his Aunt. Credits follow that are more schizophrenic than promising. The song "Mame" plays on a series of cubist/art deco panels which dissolve into a railway montage with Gooch singing "St. Bridget"; before winding up as a Roaring '20s Big City collage set to Ralph Burns' brisk new orchestrations--that work up some melodic excitement, and end on the moment the door is opened into 3 Beekman Place. It looks reassuring at first--a party in full swing, the house a beaut, and then Patrick (and we) spot Lucy, er--"Mame," standing on a piano in a crimson jumper doing the old vo-de-o-do. here are either unimaginative or idiotic. But there's a nice coda to the song that wasn't on Bway: after the speakeasy raid as they march into court, still singing, the judge proves to be a partygoer we met at Mame's. Case dismissed. "The Man in the Moon" works well--and even tho Bea Arthur is no singer, she sounds like Callas here after the croaking of Lucy. (The song is played as the finale to Vera's operetta--but wouldn't it be an opening number?) There is a funny tag after the debacle where Vera in a rage slaps her Thelma Ritter-ish dresser, who instantly smacks her back, dissolving Vera into her arms, sobbing. Ill bet this was director Gene Saks' idea, not Zindel's. (After all, Bea Arthur was Saks' wife.) Thereafter a clunky transition finds Mame reduced to working as a sales clerk. This scene, which onstage took place in a manicure salon and introduced Beauregard, is dreadfully written. Here it's set in a department store (as it was in the first movie) to accommodate a Lucy Ricardo bit on roller skates--which is so feeble, it doesn't merit a smile let alone a laugh. What follows grows more mawkish and sentimental thru "We Need a Little Christmas"--in which Gooch is decorated like a Xmas tree and Mame dons a bearded mask that's actually rather creepy. When the action shifts to deepest Georgia we get more "Lucy" shenanigans; dressing like Scarlet O'Hara, lying about her horsemanship skill; surviving a wild ride on a stallion in a fox hunt. 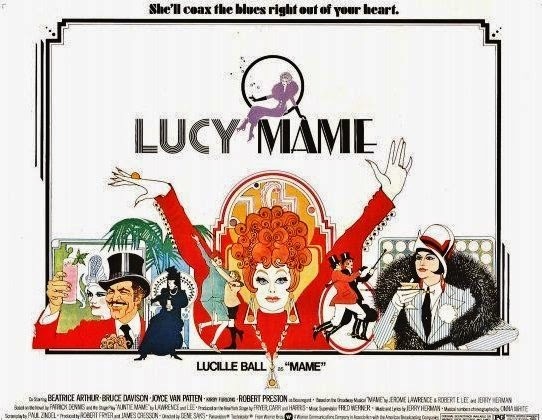 On Bway this was a song, Herman's allusion to Lerner & Loewe's "Ascot Gavotte," but the movie goes for the action instead--performed by stuntmen, with Lucy bobbing in closeup against rear projection, making comic faces of abject terror. With the fox in her arms, Mame wins the heart of Dixie, since she's "Done more for the South than anyone since Robert E. Lee," in Beau's hyperbolic tribute. (Unless he really meant the show's similarly-named librettist.) It seems the praise has to go that overboard to justify the production number to follow. 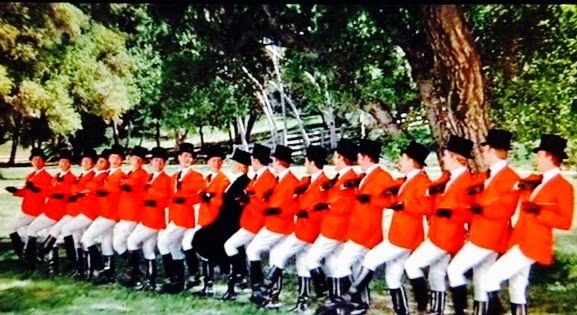 And, happily, the song is given its due; beautifully framed and shot on lush plantation grounds, with the men in red jackets, the women in black, and all in white jodpurs. It makes a striking chorus line and Onna White is back in fine fettle again--tho I could do with less Lucy prancing thru most of the number. Still, it's undeniably the film's best moment, thanks in part to Preston, whose masculine charm and smooth voice suggest a matured Harold Hill who's met his match in Mame. The end act (tho the film has no intermission) also recalls The Music Man, with Preston, his lady love and child in happy embrace. The afterglow continues thru a newly written sequence with Beau and Mame on their extended honeymoon. "Loving You" is a joy to hear thru Preston's vocal, and even more as a danceband instrumental (another deserving song overlooked by Oscar--and for some truly forgettable crap.) But visually the song is done so unimaginatively and without an ounce of wit. of "It's Today" (that only points up all that was missing in Lucy's take) and whole bus loads of pregnant unwed girls marching in singing "Open a New Window" to overstate Mame's comeuppance to the Upson snobbery. Instead of Patrick seeing the light (he thanks her in the play) we end on a bitter note; which is fast forgotten by dissolving to another leap of years. As if he hasn't ruined enuf, Zindel rewrites the coda that had Mame contriving to scoot off with Patrick & Pegeen's child on an excursion to India--told with just the right amount of exoticism. This Mame wants to drag the kid off to Siberia during the height of Stalinist Russia! It's too obscure to be a joke, too idiotic to be taken seriously--a final exclamation point to Zindel's ill-conceived rewrite. In going back to watch the original movie, I'm astonished at how much character, story, and comedy was lost in the musical--both on stage and screen. 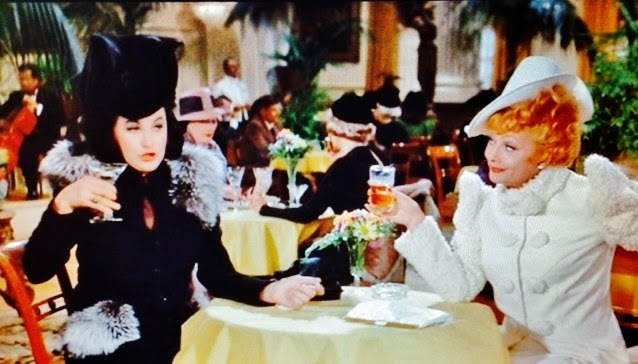 Roz gives a career-topping Oscar nominated performance; Angela a career-transforming, Tony winning one, and Lucy a final ignoble bow--tombstone to a film career begun in 1933. 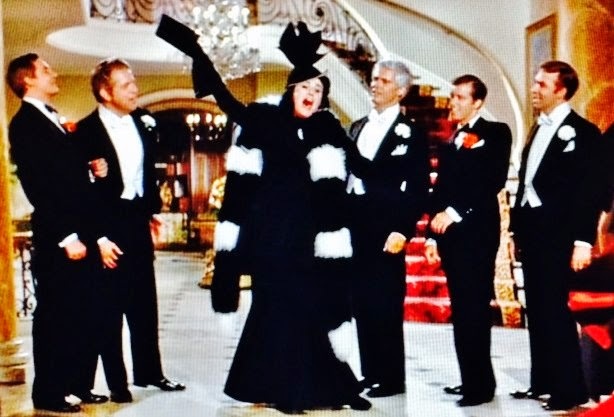 Auntie Mame remains a beloved, classic '50s Hlwd comedy. Mame lays claim only to being another nail in the coffin of film musicals. DOA in 1974. Coming out of my first winter in New York, spring had a new meaning I'd never known in California. But the Bway season was even more dismal than the first half--particularly for musicals. Lorelei and Candide were both old shows reconceived, which left but two originals: a tacky nightclub tale to frame an illusionist's act called The Magic Show (which inexplicably ran for 5 years, and gave composer Stephen Schwartz his third lucky strike in as many tries); and a '40s-themed big-band tuner, Over Here! which had a score by Hlwd's Sherman Bros. and starred the two remaining Andrews Sisters (and concerned their search for a third). The ensemble had Treat Williams, Ann Reinking, Marilu Henner and John Travolta in their Bway debuts--tho the latter soon went Hlwd and never came back. It was a lively opening night we attended, but there was little to hold this show in any esteem. It was a lousy season overall, for plays as well, but I don't recall despairing over the steep decline in musical quality and influence--which I could not have missed as a devoted student of cultural history--especially where Bway was concerned. There was always next season. Working at Brentano's was a glamorous job in my youth, with its Fifth Avenue locale, its quick access to Times Square. its Rockefeller Center lunch hours. In winter I took up ice skating in the sunken plaza, looking up to 30 Rock; marveling at my new Manhattan life--affordable even on a bookseller's salary. First run movies, Bway shows (15 that spring), meals in restaurants! Brentano's was classy enuf to have their employee Xmas party at The Four Seasons (where I downed 12 glasses of champagne in one hour, only to suffer the worst hangover I'd ever have.) I made friends at work and commandeered the paperback fiction section. In stores all over town I was finding OCRs of obscure and out of print musicals I could never find in California. I was surrounded by books, music, films, theater, in the greatest city in the world. By year's end it was apparent I wasn't moving back to California anytime soon. As happy as I was to be rid of my parents, they reacted by selling our one-story, 3 bedroom Cupertino house (which had doubled in value in just five years) and moving to a two-story, four bedroom house in a less desirable part of NE San Jose (an error in judgment that would cause great inconvenience in their old age, as well as a half-million less in value.) Livin' the dream--to each his own. It bothered me little that my digs were then a crowded parlor room in my Baba's 6th floor apartment in the decidedly inelegant neighborhood of Bway & 141st Street. I could still walk over--as I did from time to time--to Beekman Place and sit in the park with the East River vista I'd seen in many movies (some of them musicals) and bask in the glamorous view. Mame was never in evidence, but we did once see Garbo. It doesn't get more glamorous than that. New Songs: 1 "Loving You"
Camp Hall of Fame: "It's Today"